Foreign Investments And Exports: Is It The Therapy For Sri Lanka’s Underdevelopment? It is firmly believed in orthodox circles that inward foreign investment is the principal source of technological and organizational skill to an underdeveloped economy which the domestic entities struggle to acquire through indigenously designed means. Further, foreign investments are believed to be an ideal source of non-debt driven inflows to bridge the perpetual shortage of capital, deemed as a common syndrome in underdeveloped economies. In this light, economists suggest that foreign investment should be attracted over foreign debt to offset the lack of capital and to ensure underdeveloped economies can survive current account deficits that accumulate during economic growth and for the latter to be ‘sustainable’ in the long run. In the following account we attempt to understand the general character of the Sri Lankan economy by explaining the current state of its factor organisation and by placing it against the views expounded by orthodox economists who identify it merely as an economy in short supply of foreign exchange, domestic savings and exports, which is more of an accounting interpretation of the economy rather than that of the economy itself. Further, the idea of “sustainable economic growth” that is repeated by economists will be probed to understand what is suggested by the term. In this backdrop the structural character of FDIs received by Sri Lanka will be examined in connection with the fundamental issue the Sri Lankan economy now inherits. The conditions which govern the structure of FDIs and whether FDIs into Sri Lanka have been reflecting the characteristics assigned to them by economists will also be probed. In this regard, the development process of selected East Asian economies will be examined at a comparative level to assess the role of foreign direct investments in their development experience and the particular model of growth Sri Lanka could adopt considering the latter. “Sri Lanka is notorious for spending more than it earns. This generates a gap in the combined trade, services and income accounts of the balance of payments. But when it does so, it has to incur new foreign debt. That gap is partly closed through remittances and partly by borrowing abroad. But borrowings increase the gap further because a country has to spend now a sizeable amount of its foreign exchange resources to pay interest. Hence, as recommended by Indraratna too, a country may attract more FDIs”. This has been the theology of economists that propose an ever greater degree of foreign investments to the economy and considers it to be a type of an economic messiah that brings “sustainable economic growth” to the host economy. As Professor S. B. D. De Silva elaborates, this particular view of the economists suggest that they are committed to ‘sustain’ the current pattern of growth when they use the phrase “sustainable economic growth” to explain the conditions pertaining to the desired state of the economy. It goes without saying that their outlook rests on the belief that whatever that is growing in the economy should be “sustained” (except for government spending). What they aspire is the sustenance of the current pattern of growth in addition to the rate at which it is growing. In this light we shall initially review the type of growth that economists seek to sustain and return to the discussion on aspects of FDIs and economic development. The earlier day economists characterised the post colonial Sri Lankan economy as an ‘undiversified agricultural export economy’ suggesting that the problem of the economy rests in the heavy reliance of its foreign exchange income on few export crops such as tea, rubber and coconut. Output of these tends to be highly volatile due to the subjection of agriculture to the impulses of nature compared to industry and services. On the other hand, world prices of agricultural exports also show significant volatility due to seasonality in demand patterns unlike manufacture. This volatility in export earnings is believed to be the general catalyst of economic hardships ranging from instable state and private incomes and volatility in exchange rates. The latter phenomenon led the earlier day economists to conclude that the main contradiction characterizing the economy was the high volatility of foreign exchange earnings rather than the absolute dearth of it. The modern day economists however, underscore the dearth of foreign exchange earnings due to insufficient exports receipts and the ensuing heavy reliance on external financing as the primal weakness in the economy as opposed to volatility in foreign exchange income. Hence, they encourage the reliance on foreign investments and growth of exports to phase off comparatively large current and trade deficits in the balance of payments of the economy recorded since independence. If the dearth or volatility of foreign exchange earnings is considered the central issue in the economy it can be solved by sending more women to work as maids in the Middle East and get them to plough back their earnings to the home country. A country does not necessarily need to export for the sake of earning foreign exchange and there are other more ‘convenient’ means of doing so. Given that inward labour remittances do not incur any production costs the growth of the latter would be a net gain compared to exports. Further, on the other hand, it is the lack of domestic employment and indebtedness of the mass of the populace that lead to higher departures in search of foreign employment, suggesting that aggravation of these conditions would in turn lead to a higher volume of inward labour remittances and hence, to a higher rate of real economic growth. Hence, among other things, this is to say that the increase in unemployment is leading to an ‘unemployment led growth’ of the economy by causing more people to leave their homeland in search of foreign employment and remit earnings as a means of financial support for their families. On the other hand, growth in exports per se does not raise an underdeveloped economy to the ranks of the advanced economies. For instance, think of a situation where the entire economy is converted into an estate, a garment factory or a tourist hotel. In that case the total volume of foreign exchange receipts will be so large that the economy will be entirely free from trade and budget deficits. It will nevertheless remain mired in underdevelopment and backwardness as it did during the colonial days with perfectly balanced trade and fiscal deficits and high real economic growth rates. If entire Sri Lanka is converted into one massive estate the work force will be reduced to plucking tea while providing maintenance work and will be surviving on a hand to mouth existence. In the case of tourist hotels, over 95% of the jobs created are that of rank and file type, i.e., dish washers, stewards, waiters, cleaners, etc while 40% of employment demand is seasonal. Hence, in both instances the living conditions of the work force will be incarcerated, no education will be required to prepare the workers for productive activity hence universities may become redundant while however, the trade account in the balance of payments will remain perfectly balanced coupled with the real growth rate in the economy breaching limits. Basing itself on tourism, construction, trade, government spending and the related spheres of expansion, economic growth rate in Sri Lanka became one of the highest in the world while the number of unemployed in the economy rose hand in hand by circa 24% from 2012 to mid 2013 and as we have indicated in our earlier reviews 87.8% of the labour force remain employed in the informal sector (62.7%), public sector (16.1%) and as unpaid family workers (9%) despite economy growing at one of the highest rates in the world. This is to say that the pattern of growth in the economy is generating employment of rank and file type despite rate of growth beating rest of the world, indicating further, that the income distribution between labour and capital under the said framework of backward growth will be inclined towards capital in contrast to advanced industrial economies in the lights of Western Europe, Japan, North America and the NICs in Asia. The Sri Lankan economy even during her colonial period grew at rapid speeds due to increased world demand for primary agricultural products while the economy remained underdeveloped due to the absence of a structural change as an outcome of the growth process. In its turn Sri Lanka grew herself into an economic and social blind alley at the highest rates witnessed in the world during the colonial days, which what’s more resembles the current situation of the economy more strongly than ever and points that Sri Lanka still inherits her essential colonial features of the British raj days and has not been able to break away from it as a whole in contrast to the accomplishment of the East Asians. This is to show that the structure of Sri Lanka’s capital formation remains the crucial phenomenon rather than its capacity to earn foreign exchange as highlighted by orthodox economists. The exports such as garments, plantations, tourism and labour remittances remain delinked from the application of technology and scientific insights to the production process which is the central inner dynamic of capitalism rather than market driven exchange. This would mean that demand for educated labour will be low and conversely, demand for uneducated labour remains high in the economy compared to advanced regions. This phenomenon is empirically reflected by high rate of unemployment among persons with higher education qualifications (9.7%) while lowest rate of unemployment among the least educated persons (3.5%) in the economy while the average rate of unemployment is 4.5%. This is so because the dominant areas of investments in the lights of tourism, trade, garments, plantations, trade etc as a rule employ uneducated labour apart from the accounting and the managerial staff that is deployed. Hence, growth in educational level of the work force and growth in profits and outlay on wages remains generally decoupled under the current framework of capital accumulation in the economy. Universities are not needed to produce workers employed in tourist hotels, garments, casinos, plantations and other related and similar type of investments. Ironically, this could well be the reason behind why the government reduced its outlay on education and increased it on public health from the 2014 Budget as health condition of the workers demands more attention under the current framework of the economy rather than their educational level. In this light, Sri Lankan economy should be characterised in terms of absence of capitalism and an industrial capitalist class and hence as an underdeveloped economy rather than from its degree of access to foreign exchange. (It cannot be also characterised as a pre-capitalist economy given that the term implies an automatic progression of the society towards capitalism in future.) The structure of exports and investments occupies the crucial role than its quantitative effects such as the ability to persistently increase foreign exchange earnings and the level of its stability. The structural composition of investments indicates that it is less prone to infuse dynamism to the economy which is critical in phasing off the technological and organisational chasm that exists between first and the third world, which is the central structural characteristic that administers the relationship between the two main world economic regions. This is so given that investments, both foreign and local, concentrating on services, infrastructure, garments, plantations, finance, trade and assembly operations etc, as much as they are delinked with the application of technology and scientific insights to the production process also do not enter into competition with the production structures of the first world, which confirms with the model of neocolonialism where the economic form and structure of the former colonies are maintained in the absence of direct political and militaristic intervention. The absence of technological advancements as an inherent dynamic of investments in turn leads to stagnant labour productivity and creates sharp regional gaps in productivity levels which continue to widen over time as development of the technological edifice of the first world continue accelerate compared to the stagnation of the latter in underdeveloped economies. This phenomenon causes the internal price level of the backward economies to rise relative to the advanced, leading to higher rates of inflation in the former group of economies compared to the latter. This remains the primal cause for Sri Lanka’s inferior living conditions of the wage earners relative to that of industrialised nations. Further, the highly heterogeneous investment structure of advanced capitalism remains intensely integrated and hence different industrial spheres are profoundly interconnected within each production sphere (vertically) and between production spheres (horizontally). Hence, when the demand for output of one industry increases, its effect pervades across the entire economy. This is to say that in advanced industrial production, by design of the economy, the production of a single device, forces and commissions the production of many other industrial devices involuntarily and automatically from and within the system of production relations; for instance, the production of an automobile would require the production of a series of components and parts drawing supplies from diverse production spheres which opens up many industries to produce a single product. Hence, the multiplier effect of further investments in an advanced capitalist economy tends to be sharply above an underdeveloped one, another dynamic in capitalist accumulation which augments home markets and effective demand and hence further improvements to the technological structure in comparison to underdeveloped regions. For instance, an increase in demand for tea, rubber or garments does not create a similar economic reaction explained above given that these primary economic activities are strictly isolated and disintegrated from each other and from rest of the investment fields in the economy and are hence, not interconnected through and within the relations of production. This is to say that modern capitalism from both demand and supply aspects of accumulation have the tendency to self expand the investments’ universe through the creation of its own effective demand and markets. This particular feature tends to stretch the trade cycle in time and depth from both supply and demand ends of the economy and hence the duration of each cycle tends to be longer in the advanced world compared to underdeveloped regions. The absence of the self expansionary tendencies of capital in underdeveloped economies is one of the crucial factors which create demand deficiencies, smaller home markets and more importantly a higher rate of saturation of investment spheres within the growth process compared to the developed world. This is empirically indicated by the short term boom and bust cycles faced by the Sri Lankan economy during the past four years in an attempt to grow faster. This is to say a perpetuation of a nonindustrial investment structure and a profit generation process which grounds itself on it would inevitably tend to nurture the prevalent stagnant real income levels assigned to labour and the insufficient absorption of the latter within the domestic economy indefinitely. This is indicated by Sri Lankans seeking refuge in foreign employment in large numbers and over 25% of economy’s workforce being employed abroad. Hence, the real incomes assigned to labour will remain stagnant despite the demands for higher wages by trade unions. This is so given that it remains impractical for the employers to raise real wages without a corresponding reduction in the real share of profits from aggregate income if latter remains unchanged under stagnant labour productivity levels. Hence this is to say real wage increments are detrimental for profits and investments in the third world relative to the advanced economies. If proportions of production factors in an economy reflect a higher productive capital (i.e machinery excluding buildings and land) to labour ratio, it seek to reduce the total outlay on labour (wages) while simultaneously increasing the amount that can be assigned for an individual worker, which is a critical characteristic of an industrialised production structure and hence of capitalism. That is to say under the said form of factor proportions, per worker incomes and profits will rise while total wage bill in the economy falls, which is an impossible quest if labour is not replaced with capital as a result of industrialisation of production. For instance, per worker real income in Japanese plantations, production process of which is heavily mechanized, is well in excess of the real income received by an estate manager in Sri Lanka while Japanese estates generate many times more real profits relative to that of Sri Lanka. Tea leaves pluckers in Japan arrive to work in their estates in luxury cars and use them for few years and sell them to buy a new one. These second hand cars are then exported to Sri Lanka and a manger or an executive would purchase it. On the other hand, despite paying such high salaries for tea leaves pluckers in Japan the profits of their estates are probably few hundred times that of Sri Lanka while ironically, if the plantation workers’ wages in Sri Lanka are raised by just two hundred rupees the entire sector is prepared to go bankrupt instantly. The condition of the Japanese tea leaves pluckers is such; however, conversely, Sri Lanka’s plantation workers remain buried in absolute destitution regardless of the fact that both Japanese and Sri Lankan workers in this case are producing the same product i.e., tea. The deterioration of Sri Lanka’s estate workers’ living conditions is empirically shown by a recent study carried out by the Institute of Policy Studies on estate sector poverty. 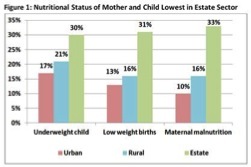 The report states that ‘about 30% of children under the age of five are underweight, nearly 1 in 3 babies have low birth weight, and one-third of women of reproductive age are malnourished’ in the estates. The process of plucking tea leaves in Sri Lanka’s estates have been reliant on the bear hands of the workers since its inception two centuries ago while the Japanese continuously transformed the process through increased mechanization, indicating that industrialisation of production draws the ultimate demarcation between worsening and improving overall living conditions. This is to say that the delinking of the profit maximization process with increased productivity of labour through industrialisation, which is the central inner dynamic of the Sri Lankan economy rather than the trade and fiscal deficits highlighted by our eminent economists, worsen the degree of income inequality and stagnates the incomes accrued to labour. 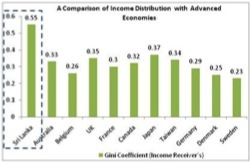 The state of Sri Lanka’s income distribution is reflected by Gini coefficient of Income receivers remaining as high as 0.55 while the average for industrialised economies remain close to 0.30. The Lorenz Curve data which calculates the distribution of national income among the different layers of income groups illustrate that 50% of the population at the bottom of the income ladder has access to 19.1% of the total national income. This is to say that per capita income specific to this group is LKR 11,831 in 2012 suggesting that aggregate incomes of half of the population is considerably lower than half of per capita income at the national level (LKR 31,083 in 2012), demonstrating the failure of the majority to live up to the average income level of the economy. This is to say that advancement of modern industry leads also to a degree of equality in distribution of income within the economy and vice versa. The higher degree of equality in income distribution also expands the size of the home market for mass consumer durables and hence breeds more avenues for further capital formation within advanced regions. In contrast the higher degree of inequality in income distribution is a key factor which leads to limited home markets for mass consumption goods and hence relatively short time duration taken for market saturation in underdeveloped economies. This also leads to the conclusion that distribution of income at the world level and within national economies is a function of the uneven levels of industrial development at the world level. Hence, the asymmetrical organisation of factor proportions within the production sphere determines the ratio of income distribution between capital and labour rather than the levels of factor ownership claimed by orthodox economics. Hence, a production structure organized under higher degree of productive capital to labour ratio would mean a more equal distribution of income within the related context and vice versa. Consequently, it makes clear that the distinction between the relatively constant productivity industries due to absence of industrialisation of the production process and those in which productivity can and does rise is a very real one and one which is of practical importance with regard to economic advancement and living conditions. The reversal of the process of underdevelopment would hence require an entire reorganization of the production factors of the economy under the rule of the state as performed by economies such as Japan, Taiwan and South Korea with a view of the mutual relationship to be established between industry and agriculture and between the state and the productive forces of the economy. However, the underdeveloped societies have become so accustom to conditions of backwardness and so firmly fused itself within the system of global division of labour that the latter has now acquired a self perpetuating character, a sense of automation to its existence, preventing the political economic order from reaching beyond its immediate reality, which is reflected by our economists holding annual sessions to discuss ways and means to “sustain” the backwardness of the economy (we hope to discuss the role of ethnicity and its institutional usage as a means to sustain underdevelopment and the broad cultural dynamics that constitute underdevelopment compared to the advanced regions of the world in a separate article as underdevelopment is not merely an economic phenomenon but pervades the entire socio-political edifice). The impersonal and mutually discrete connections formed in the market mechanism are assumed to produce an automatic development of personal relations materially and conceptually, without the understanding of the positioning of the latter within the broader reality, being incorporated into the progression of market mechanism. On the other hand, the orthodox economists remain inimical to a fundamental transformation in the structure of the economy attained by the use of planed measures by Western and few East Asian economies which currently seize the centre of the world economy. Sri Lanka does not need ‘growth’ or ‘sustainable growth’ for that matter, but what she needs is a general transformation in the production structure and a political-legal superstructure that is committed for that purpose. Who’s Afraid Of Mahinda Rajapaksa? Steamrolling Of Central Bank By Minister Of Finance: An Unsavoury Development?